You don’t have to suffer from acne to have a bad case of blackheads. Blackheads afflict people of all ages and skin types. Commonly found on your nose and chin, they give your skin a distinct greyish color and where there is one, there are usually many. Deep blackheads are a whole other problem. Also known as embedded blackheads, these make their home deep under the skin’s surface. Not only are they near impossible to remove, they can cause scarring and even form into cysts if left untreated. How Do Deep Blackheads Form? The average blackhead occurs when dead skin cells are unable to shed from the surface of the skin in a healthy and balanced way. When those dead skin cells meet your sebum in a pore, they build up and cause a clog. A clogged or plugged pore is known as a comedo. If the skin over that bump opens and the comedo is exposed to air, it oxidizes and turns black. Like your average blackhead, deep blackheads can appear on your face, neck, back, shoulders and chest. First, deep blackheads can start as a normal blackhead through the process described above. When left untreated, the sebum in the pore solidifies. Over time, that blackhead can become larger and form a deep blackhead. The second way deep blackheads form is through enlarged pores. If your pores are enlarged, a blackhead has more room to develop – with a lot more sebum and many more dead skin cells. These plugs are far larger than your average blackhead, making them more difficult to get rid of. When they go unnoticed or they’re left untreated, the blackhead ends up much deeper under the surface of the skin and becomes embedded. It’s possible that some cysts that require professional removal can start out as deep blackheads that won’t go away. Most blackheads are shallow, close to the skin’s surface and easy to treat with a bit of warm water and a manual extraction tool. A deep blackhead is far more difficult to remove. Because they are deeply embedded in the skin, they require professional attention. Removing a deep blackhead with an extraction tool or with your fingertips could cause serious damage to your skin. Getting rid of deep blackheads on your own can, and most likely will, leave a pit in your skin. That’s especially true if you don’t follow-up with proper treatment after removal. 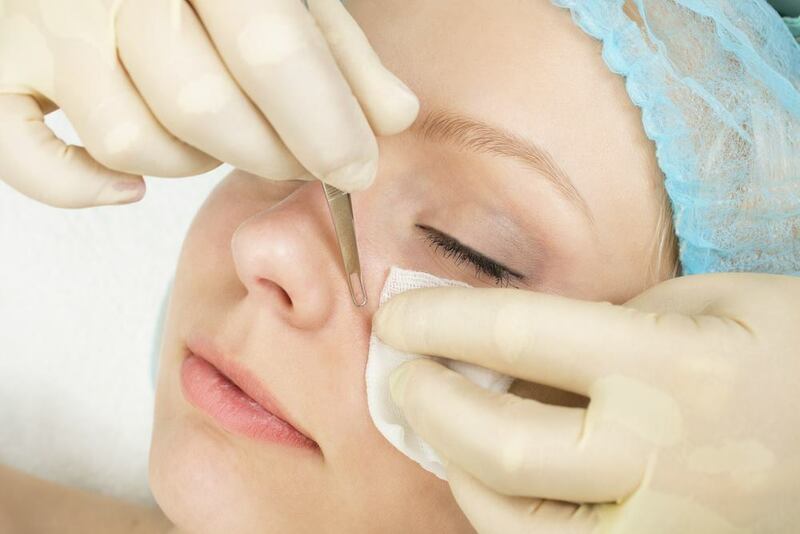 When an embedded blackhead is removed from deep within the skin’s surface, your body is unable to form collagen in a normal way around that area. When collagen can’t fill the skin surrounding the embedded blackhead, you’ll get a deep ice pick scar. This type of scar may require skin resurfacing to correct. Instead of risking ice pick scars, use a blackhead removal tool, or go to dermatologist or other skin care professional to have your deep blackheads removed. They can remove your embedded blackheads, provide the proper follow-up treatment as well as prescription medication in the case you have ongoing issues with deep blackheads. Prevention should be your first line of attack. A strict cleansing routine can help you reduce the chances of forming them in the first place. You should be washing your face twice per day with an acne-fighting cleanser. Follow cleansing up with a toner that contains ingredients like alpha-hydroxy acids (like glycolic or lactic acid) or beta-hydroxy acids (like salicylic acid). These ingredients help to remove dead skin cells from the surface of the skin as well as restore a healthy balance and production of sebum. After toning, use an oil-free, noncomedogenic moisturizer to help restore any oils stripped away in the cleansing and toning process. Before bed, always remove your makeup with a water-based makeup remover before cleansing for a second time. Follow this up with stoning and moisturizing and you’ve got a great routine for keeping away deep blackheads. If deep blackheads are continuously forming on your skin, you may want to consider a prescription medication that can be obtained from your dermatologist. These can be oral prescriptions or simple spot treatments, but your dermatologist can help you figure out what’s right for you and your skin. Blackheads that embed themselves deep under the skin’s surface are far more serious than your average blackheads. And the most important thing to remember is that you should never attempt to extract these on your own. The scarring that can result from imperfect removal and improper follow-up is simply not worth the risk. Prevent deep blackheads with a strict cleansing routine and the right ingredients and, if they still occur, seek help from a professional – it’s what they’re there for!